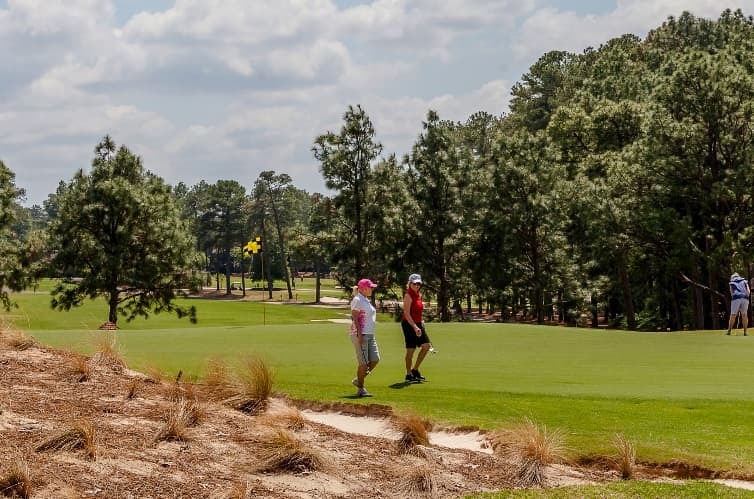 VILLAGE OF PINEHURST – Well, it’s working. Six months ago, Rice’s top player Mitchell Meissner, played the best he could play. From tee to green, he hit the ball better than he could remember. There was just one problem. With a couple of left-handers on the Owls, Meissner asked to borrow their putters on the practice green. Almost immediately, something clicked. Since then, Meissner has been on a tear. Already an accomplished player before making the drastic switch, he’s soared, becoming Rice’s all-time career winner. His run has continued through the summer, taking the Conference USA Championship before winning the Greater San Antonio Match Play in early June. Ten days ago, Meissner won the Texas Amateur, a championship that counts Ben Crenshaw, Mark Brooks, Scott Verplank and Bruce Leitzke among its past champions. It helps that his mind is free again. It’s not that way anymore, as was evident on the 16th hole. Though he built a large lead over North Carolina’s Ryan Gerard throughout, Gerard began to apply some pressure late in the match. After his chip from the front of the green ran by 6 feet, Meissner faced a delicate putt back down the hill. He settled comfortably over the ball, took one look at the cup and calmly rattled it in, eliminating Gerard 3 & 2. “I’m not scared about making 6-footers anymore,” Meissner says. Schlottman is anything but fearful on the golf course. While he had trouble off the tee against North Carolina senior Jose Montano, Schlottman was a master scrambler, finding ways to get up-and-down all day during his semifinal match. That enabled Schlottman to build and keep a lead throughout the match, but when Montano made a late surge, Schlottman was able to fend him off – perhaps because he didn’t need his driver. After trimming the deficit from three holes down to just one, Montano hit a nice shot into the par-3 15th. With the pressure on, Schlottman lofted a searing high fade with a 5 iron directly at the pin tucked in the back-right. The ball landed softly just 5 feet away, and after making the putt, Schlottman walked to the 16th tee 2-up. But Montano won the 16th with a par – Schlottman lost his drive to the left – and after another errant drive on 18, Schlottman pulled his approach left of the green. With Montano comfortably in the middle of the green, Schlottman deftly skidded a chip shot to a tough hole location in the back-left of the green, forcing Montano to make birdie to extend the match. Montano’s putt lipped out, giving Schlottman, who made the match play field after surviving a 9-for-6 playoff on Tuesday, a berth in the championship match. Still, there was work left to be done before Schlottman could call it a day. “I’ve got to go to the range to figure out how to hit a fairway,” he said. The Championship’s finals will be played at 7 a.m. on Friday. Admittance to all rounds is free to the public, which is encouraged to come watch. No. 13 Mitchell Meissner vs. No. 31 Ben Schlottman, 7 a.m.